Katie fell in love with the Knee Knacker race when her brother ran the race in 2011. Before that, she didn’t even know the sport of trail running existed!In 2012, Katie put her name in for the lottery but sadly was not selected. However, she was lucky enough to run it in 2013, 2014, 2015 and 2016! 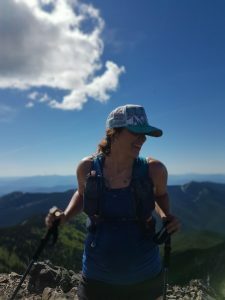 Her love of the race and the north shore mountains was strong enough to draw her to move off Vancouver Island to the mainland where the trail network sets her heart on fire. Katie joined the Knee Knacker committee in 2017 as a member at large. Her main role is to capture action items and keep everyone on track with their tasks! She also supports the registration process / website updating. This year she will be taking the lead for the 30th year celebration. Her favourite part of the Knee Knacker course is from Cypress aid station to Brothers Creek … and the last 200m! Katie was the first woman to complete the Buck Me This Goat is Knackered challenge in 2015. She loves trailing running, the alps, singing out loud while running, and coffee. Enzo grew up in the Centre of the Universe, aka Toronto, and never saw a mountain until the mid-1970s. While attending University of Toronto, he took a summer job working on a railway gang in Alberta. He was awestruck by the beauty of the Rockies, and enjoyed his first camping and hiking trips that summer. 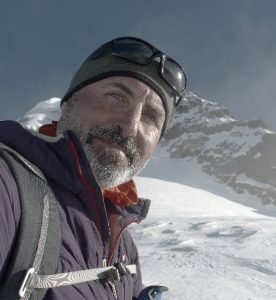 By the early 1980s, he could no longer resist the call of the mountains and he moved to Vancouver. The mountains drew him even closer, and he moved to the North Shore in early 1989. A couple of months later, Enzo met Shane Collins (another transplant from Toronto). 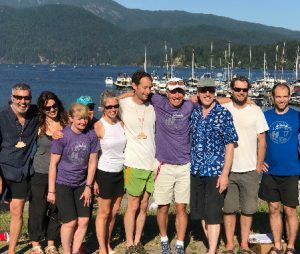 In June of that year, Enzo and Shane led the “Original Eight” in a 30-mile jog across the North Shore mountains from Horseshoe Bay to Deep Cove. They affectionately referred to it as the Knee Knacker. Flash forward to 2018, and the little run is back for its 30th edition in July, a healthy and strong staple in the ultrarunning community led by a dedicated team of volunteers. Enzo has continued to be involved throughout the 30 years, and is commonly referred to as the Godfather/Grandfather of the event ? Guiding the Knee Knacker through its early years was a passion for Enzo, but he still found the time to complete the race 4 times over the years. In fact, he is one of only 2 runners to complete the race in each of 4 calendar decades – 1989, 1992, 2006, and 2013! Besides the Knee Knacker, Enzo has also completed 4 100-mile races as part of a total of over 100 marathons and ultramarathons. These days you are most likely to find Enzo riding on 2 wheels through the mountains, especially drawing him to the mountainous regions of his parent’s home country of Italy. But, a new calendar decade will dawn in a couple of years…and nobody has run the Knee Knacker in each of 5 calendar decades…just sayin’ ? 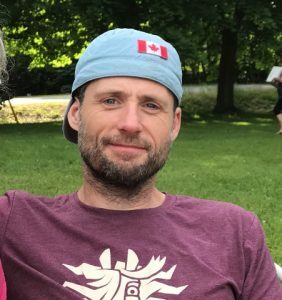 Originally from Winnipeg, Scott moved to the West Coast and quickly adapted to the outdoor lifestyle….skiing, mountain biking, hiking, camping, backcountry skiing, and trail running. Eventually he fell in with a bad crowd who frequently played in the rainy/snowy mountains and took great pleasure in sandbagging their friends into all sorts of adventures. 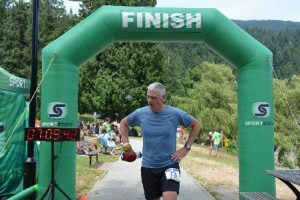 He stumbled upon the Knee Knacker on a sunny Saturday back in the 90’s when he was visiting Deep Cove, and saw these tired, muddy bodies running into Panorama Park. He was mesmerised, and filed it away as a curious event…until succumbed to his buddy’s peer pressure in 2007, and put his name in for the Knee Knacker…his first stab at an ultra. The lottery was cruel/kind to Scott, and he made it into the event on his first try. Immediately after successfully completing the event, he knew he had found a new passion and decided that he would return year after year. Unfortunately, the lottery gods had other plans… despite applying every year since then, Scott has been 5 for 10….including twice being admitted by the old “3rd-time-Lucky” rule. As Scott points out “At that rate I’d need to live to be 107 to get 25 done”. Scott is considered by many as the patron saint of Knee Knacker lottery. Despite such a string of lottery “failures”, Scott’s enthusiasm for the event never diminished and led him to volunteer on race days, and in 2015 he joined the race committee. Scott brings with him a strong set of skills from his days as a corporate man, and currently he is the committee’s Sponsorship Coordinator. 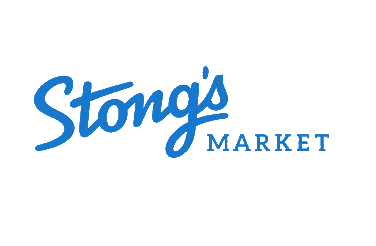 You will also find him at the Sunday morning training runs (just look for the 6’-4” elder statesman)…he has a wealth of knowledge, so feel free to pick his brain…he promises that he won’t do any sandbagging. I came for the challenge; I stayed for the community. 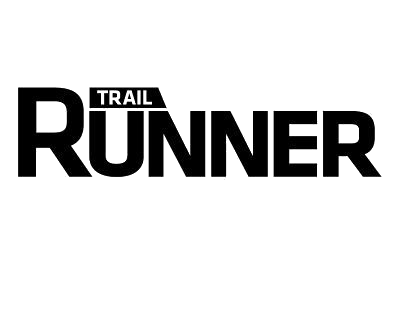 I’m blessed to have met so many tremendous people on the trails and love how the Wednesday night and Sunday Knee Knacker training runs feel more like a reunion than a workout! Many folks have said the Knee Knacker has a way of getting in your bones and I agree completely: I’ve now been involved with the Knee Knacker for half my life, including 5 years on the committee looking after the various race permits (12 and increasing every year!). My favourite part of the Knee Knacker course is the mountain of Honey’s Doughnuts at the finish line. I grew up on the North Shore in Deep Cove. The mountains were our playground. We spent the summers hiking and the winters skiing on them. My parents had a cabin on Hollyburn Mountain for years. When I was little, my mom taught me to ski on Mount Seymour. She believed it was important to learn how to hike up on skis just as much as go down. I learned at a very young age how to hike/power up those hills. Ski tickets were a rarity until I was a teenager. I started running in the North Shore trails in the late 1980’s. There were not a lot of trail runners on the shore at that time! 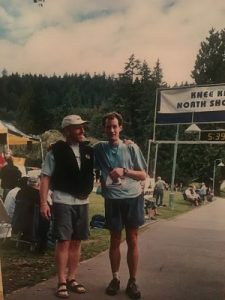 In 1991, I heard of a trail run that went from Horseshoe Bay to Deep Cove. It was called the Knee Knacker Trail Run. This seemed very interesting to me as it looked quite challenging and was in my backyard. 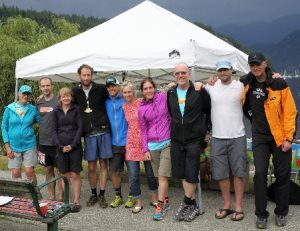 That summer, I completed my first KK Trail race and was hooked from then on. Since then, I have completed 13 KK races, placed in the top three a number of times and won the race twice, setting the record in the open and master’s field. During all these years, I have volunteered, run, and have been a part of a fabulous KK committee. It has been an honour being a part of this special event for so many years. 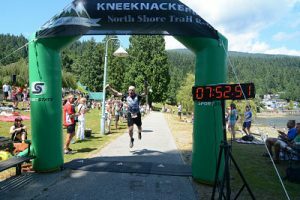 Dennis stumbled across the Knee Knacker race while doing the Grouse Grind in 2008, and has been stumbling through nearly all of the Knee Knacker races since 2009. What he lacks in speed on the trails, he makes up in the quickness of his email replies as the Volunteer Coordinator since 2010. As a life-long introvert, the chance to interact with the 250+ volunteers each year has been an incredible opportunity to meet some of the most fascinating athletes and characters (often combined as the same individual) our community has to offer. He has completed trail races of many distances since his first ultra-marathon in 2010, and now is overjoyed to be able to share the sport with his lovely wife and two young boys. He recognizes that he’s a mid-packer at best, but his passion and commitment to the sport are at an elite level. He has no favourite part of the Knee Knacker route, but does have a love/hate relationship with the Seymour Grind. Wendy’s an ultra cyclist, ultra runner, race director and the reason why Kelsy can run Knee Knacker each year. Wendy takes the reins for race day and does an incredible job orchestrating all of the moving parts. 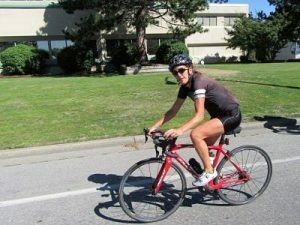 Wendy prefers to stay under the radar with her incredible athletic accomplishments including ultra course records, 100 km national team representation and 4000+ km unassisted cycling races. These days you’ll find Wendy already deep in training for her summer cycling season. Bev became a member of the KK Committee through the back door! As a long-time volunteer at the Banquet she agreed to join the Committee because she loves a party. 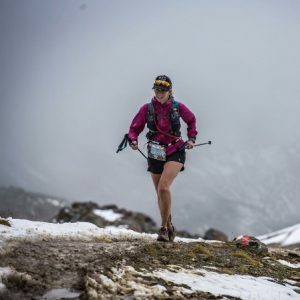 She loves being a part of Knee Knacker as she is astounded by everyone’s fitness level, love of the mountains and commitment to the race and the community. 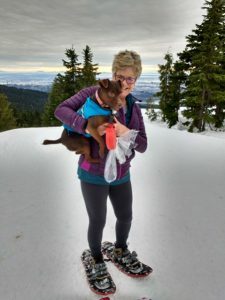 Although she’s no longer a trail runner (darn those creaky knees) Bev does run and has completed 27 marathons, including the Boston Marathon twice. Aside from running, Bev loves dragon boat paddling and she was on the National Women’s team in 2013 winning the gold medal. She also enjoys hiking, swimming, skiing and travelling. 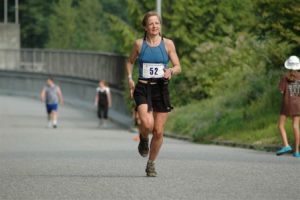 Bev considers it to be a great honour to be on the Race Committee and her favourite part of the Knee Knacker course is Panorama Park in Deep Cove. Glenn has been tagged by some as the “Professor”. 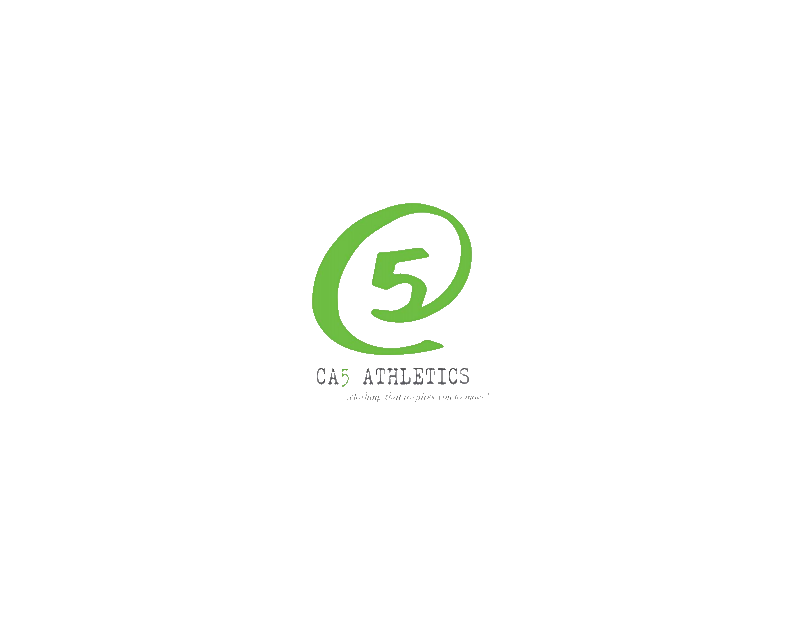 With ultra-knowledge of all things outdoors and a self-proclaimed “gearhead” he has participated in between 50 – 60 ultras from 50Km to 100 Milers (10 of those including Western States, Tahoe Rim, Cascade Crest, and Wasatch) and a couple of 24 hour events for fun. For first timers to trail running you’ve got to get tips on running downhill from Glenn. He says he came by it genetically….his mother was a marathoner and he was looking to up the ante…. His sister somehow convinced Glenn (a non-runner at the time) to sign up for KK. He was drawn to the aesthetics of this line weaving over the North Shore Mountains from Horseshoe Bay to Deep Cove and thought it would be a great challenge. He also figured that the lottery would save him. He obviously had better luck than some as it did not save him, he got in on his first try. Glenn started training by running with a marathon group, but always felt like a square peg in a round hole. It wasn’t until he started with the KK training group that he realised that he had found his tribe. Glenn joined the committee in 2004, because as Kelsy says “it gets in your blood”. Glenn’s role on the committee is Trail Coordinator….basically he ensures the trail is still around on race day (watching for changes, erosion, fallen trees, getting chased by falling rocks, snow, bridges, etc…). For race day, he also organises the 30 miles of trail marking, sweeps, and North Shore Search and Rescue. He also co-leads the training runs. Jeff’s been involved in Knee Knacker since he first ran it in 2000 after hearing about “some run across the north shore”. 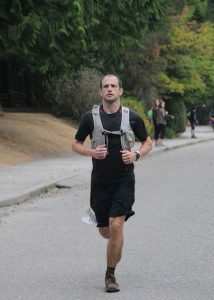 It wasn’t until just weeks before race day that year that he realized the course went from Horseshoe Bay to Deep Cove. A veteran of over 60 ultras including multiple sub 24hr 100mile finishes, 2018 will be Jeff’s 19th consecutive Knee Knacker. Jeff’s been on the Knee Knacker committee since 2003, leads the graphics and design of the t-shirts and behind the scenes is the force that “keeps the RD sane” most days. When Jeff’s not running in the mountains or renovating his home, he makes fine furniture. Kelsy is an ultrarunner, Race Director & in her day job outside of her mountain pursuits, leads a global team at SAP. She’s an eternal optimist who is still chasing her PR, and is a champion of inclusion and the value of sport in developing leadership. Kelsy became involved in Knee Knacker in 2000 when she volunteered as a marshal at Grouse Mountain. She was intrigued by the challenge and signed up for Knee Knacker the following year as her first ever race. Since then, Kelsy’s run over 40 ultras in Canada, the US, Europe and Australia. Even after all of these years, Kelsy gets (ridiculously) excited to see people become connected to the Knee Knacker community and do things they thought weren’t possible. Kelsy’s run Knee Knacker 12 times, has been Race Director for 14 years (thank you Enzo!) and warns people that the “Knee Knacker gets in your blood”. In addition to our volunteer committee members, we have over 200 race day volunteers and many people that contribute behind the scenes year after year. A special mention goes to North Shore Rescue who we also raise funds for, Greg White who is our race day cutoff coordinator extraordinaire, Karen Chow who orchestrates a herculean photography effort, our aid station captains, some of who have been coordinating their team for over a decade, Ran Katzman who leads the Wednesday night training runs and this year also took over the redesign and management of our website, and Tom Craik who is taking the lead with our community/social engagement this year.